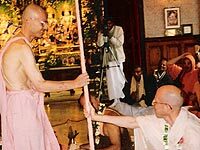 Kadamba Kanana Swami started his spiritual life in Vrndavana, the Holy land of Krishna and immediately felt he found his home. He became a disciple of HH Jayadvaita Swami. He joined ISKCON in 1978 shortly after Srila Prabhupada’s departure from this world and served in Vrndavana from ’78 to ’84 in various types of management. 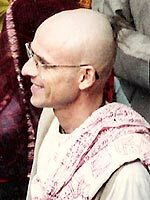 After a one year break from India in Australia he returned to India this time to take charge of the construction of Srila Prabhupada’s Samadhi in Mayapura and remained there from ’85 to ’90. He liked the pioneering spirit of working in India and above all he liked to stay in the Holy Dhama. In 1990 he became the Temple President of the Krsna Balarama temple in Vrndavana and remained in that position untill ’95. After that he began to travel and preach around the world and in 1997 he received sannyasa. These days besides preaching in Europe, South Africa, India and Australia, he still has some involvement in supervision of the Vrndavana temple.